Kickstarter is a great adventure in the democratization of business finance. Not everything on Kickstarter succeeds, to say the least. I’ve backed a couple of projects over the years, and actually received my rewards. There’s one project I was watching over the last year, that I did not invest in, the Tiko 3D printer. It was fun watching this story unfold. They ended up being a year late with their delivery, went through many trials and tribulations, and essentially failed to deliver in the end. Looking at this picture now, in retrospect, we can assume that it was a complete fabrication. Having printed such an engine block on my very commercially available printer, I know that they could not have possibly generated those pieces given the state their printer was in. Without a cooling fan, they would not have been able to generate the intricate detail, and with their components overheating, they would not have lasted through a print. But, that’s retrospective. When you’re watching the train wreck happening, you’re rooting for them, giving them the benefit, and hoping they’re actually doing as well as their arrogance would lead you to believe. For those few thousand who received their units, I’m betting it will turn out to be their MakerBot Cupcake. A first printer, not many good prints out of it, then they’ll move on to a real printer, and this becomes salvage in a couple of years. The saving grace is it was only around $200, so from that perspective, anyone who backed the project was only out a fairly small investment. That amount of money is probably easily spent on getting coffee every morning for half a year. They did show that you can come out with stylish looking things. I’m sure someone else will attempt something similar, having benefitted from Tiko’s mistakes. They’ll come up with a better solution for cooling the internals, they’ll add a door, they’ll put the filament outside the box, they’ll make it bigger, they’ll add a parts cooling fan, and it will come from AliExpress still for $200. It will support Simplify3D, Cura, and Slic3r instead of their custom slicer, and the world will move on. Tiko as a company has not thrown in the towel and said “we’re out of business”, but they have essentially put everything on hold as they’ve run out of money. Another project I’ve been following is the GlowForge 3D laser “printer”. That machine is similarly way overdue, and they have a similar vibe of secrecy about them. This time I am holding out hope that they do in fact deliver. You can actually cancel your order up to the last moment before it’s delivered, but again, while you’re watching the train wreck, you’re hopeful that they’ll pull it out in the end and everything will be alright. So, come on GlowForge! I’m rooting for you. It’s kind of like watching the Truman Show. From a casual look, it appears to be the same as the previous version (Cranberry). The primary similarity is that it is a delta robot (3 arms, with parallel movement). There were a couple of design goals for this version. The very first version of the PolyBot utilized threaded rods, and printed vertices. When I had some friends do a build test, it took a full 40 minutes for them to figure out how the various vertices needed to fit together. It was very complicated, and that wasn’t even the interesting part of the build. So, I wanted to simplify the vertices to the point where a child could assemble the basic frame in a matter of minutes. By looking at one design that utilized vinyl tubing for something completely different, I was inspired to come up with the vinyl tubing based vertices. These vertices have a couple of advantages. The first advantage is that they are very easy to construct. First you figure out what rods you’re going to use in your construction. In this particular case I’m using 3/8″ solid aluminum rods. Then you find vinyl tubing which will fit snugly over this size of rod. In my case, vinyl tubing of the same inner diameter works fine. To make the vertex, you just cut a couple pieces of the tubing (about 3 inches long), and drill holes in their centers (or use some sort of punch). I put a screw in the middle with some washers on the outside, fasten with a nut, and you’re done. The production of these vertices is very amenable to an assembly line, whether it be at your kitchen table, or in a automated factory. The tetrahedron form of the frame is very easy to assemble. Once you have these vertices in hand, you go through two steps. Step 1: Form the lower triangle. First you cut 3 rods to the same length. I use 18 inches as it makes for a reasonably sized bot. Then you just stick the rods into 3 vertices and form a triangle. That makes the base of the tetrahedron. Step 2: Then you stick rods into the holes pointing upward, and that forms the sides of the tetrahedron. Pull the three rods together at the top, and place the fourth vertex, and you’re done. I use a glue to keep the rods firmly in place. In this particular case, I’m using ‘Goop’. It’s great stuff that sticks to steel/vinyl, when they’re in this close proximity. Any epoxy/resin glue thing that provides some bit of adhesion will work. The forces on the frame are not that strong. The cool thing about this PolyBot design is that the frame is not that important. Any way you can form a tetrahedron will do. It just needs to be a stable form. 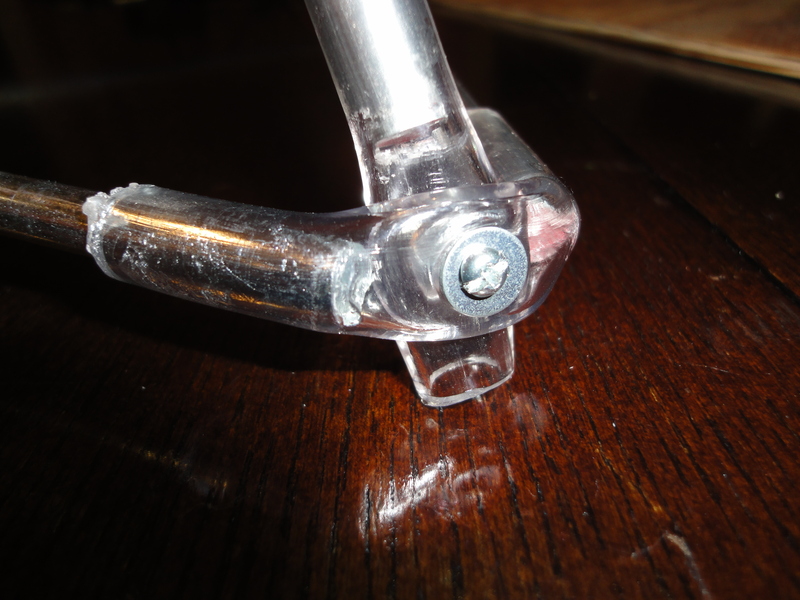 In this case, using vinyl tubing as a structural component is fine. It’s strong and stiff enough at these sizes to not really move around that much. If it’s not stiff enough, simply construct a frame using a different material, like printed plastic, or aluminum, or what have you. Another design element is the usage of zip ties. If I wanted to use screws, which are the more traditional fasteners on machines, I would have to think about adding substantial material in order to provide something the screws can fasten into. Rather than creating even more structural parts, I figured I’d use zip ties. They are used in two places. the first is the framing elements themselves. 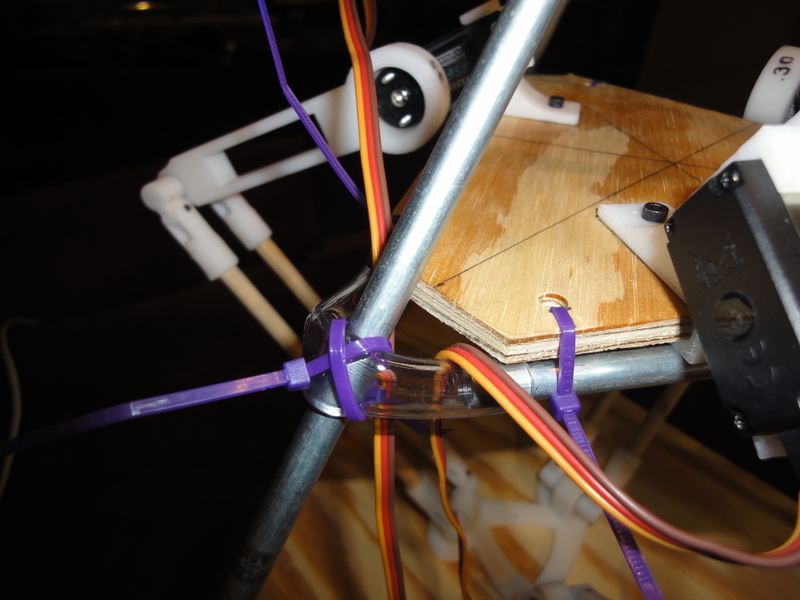 As can be seen in the picture, the zip ties provide the connection between the servo platform, and the framing members. This works out great. First of all, it’s the nature of the triangles for the platform to want to sit naturally at a certain level on the frame. Once you get it sitting in its natural position, you just have to secure it in place with the ties. These ties can be pulled pretty taught. Since they are pulling against both the aluminum rod, and the softer vinyl tubing, they form a pretty strong friction fit between the two. This fitting seems to be enough for my purposes. The other usage of the ties is in securing the platform itself to the aluminum framing. Here again, friction is your friend. the platform rides on top of the vinyl tubing, so when you pull tight on the zip tie, you are creating more of a friction fit between the wooden platform, and the tubing. In the case of the servo platform, this also applies quite a force to hold the servo mount in place so it won’t wiggle around too much. This helps eliminate the need for even more screws on the servo mount. This is the basic design work that went into the frame. Putting a frame like this (18″ on edge) together cost about $10-$15. That’s including the vinyl tubing, screws/nuts, aluminum rods, and pieces of plywood. The materials can all be had at any hardware store. The hardest part is actually cutting the platform pieces into the triangles. Other than that, all that’s needed are some scissors, screw driver, and strong fingers. If it were in kit form (pieces already cut and drilled), it would probably go together in about 10-15 minutes. At least that was true for when my wife assembled it. And why this tetrahedron frame in the first place? The tetrahedron is the smallest, most stable, of the Platonic solids. As such, it does not require additional bracing, or support and whatnot. It will be as rigid as the vertices will allow, and as stiff as the rods are. Additionally, there’s plenty of room for easy improvements. You can easily use carbon fiber rods instead of aluminum. You can replace the vertices with something stiffer and more reliable. You can create new supports for the servo platform. Changes can be incremental, not requiring a re-design to make a small improvement.